This Reticulated Python (Malayopython reticulatus) is the largest species of snake on the planet, but there are boas that come very close. Damien Esquerre. Around the world, in a range of different environments, pythons and boas resemble each other. A new study reveals that these commonalities come not from common ancestry, but because the two families of snakes found similar solutions to the same problems, a process known as convergent evolution. In wetlands and forests, pythons prey on small mammals, birds, and frogs. To the untrained observer, an aquatic python looks more like an aquatic boa than a tree python. Nevertheless, the reason we classify all the pythons as one family and boas as another, is because they each descended from a common ancestor not shared with anyone else, rather than just lumping species together because they resemble each other. In many different environments pythons and boas adapt in such similar ways they can be hard to tell apart. 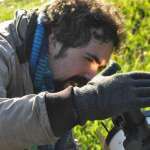 Damien Esquerre. 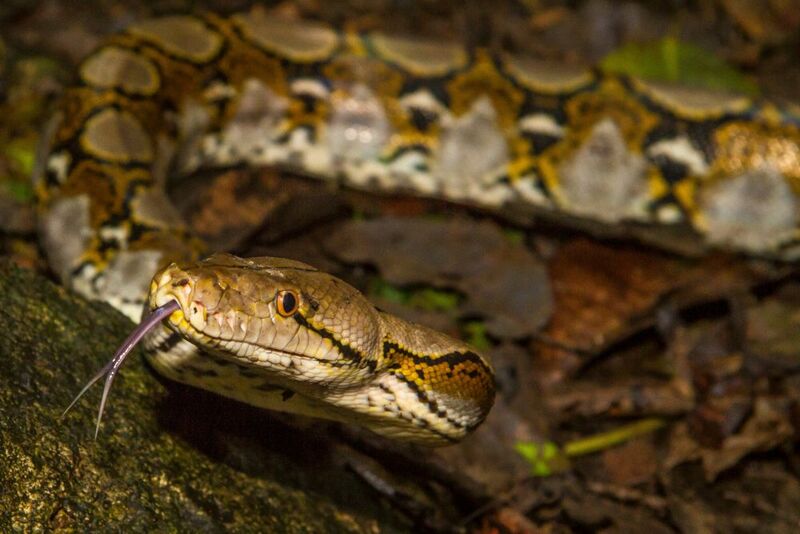 Australian National University PhD student Damien Esquerre compared the head shape of 1,073 specimens from 34 species of pythons and 45 boas, to show how, when confronted with matching environments, each went for remarkably similar solutions. He measured head shape, because in a limbless predator like a snake, it is an extremely important feature. The two snake families allowed Esquerre to address this. 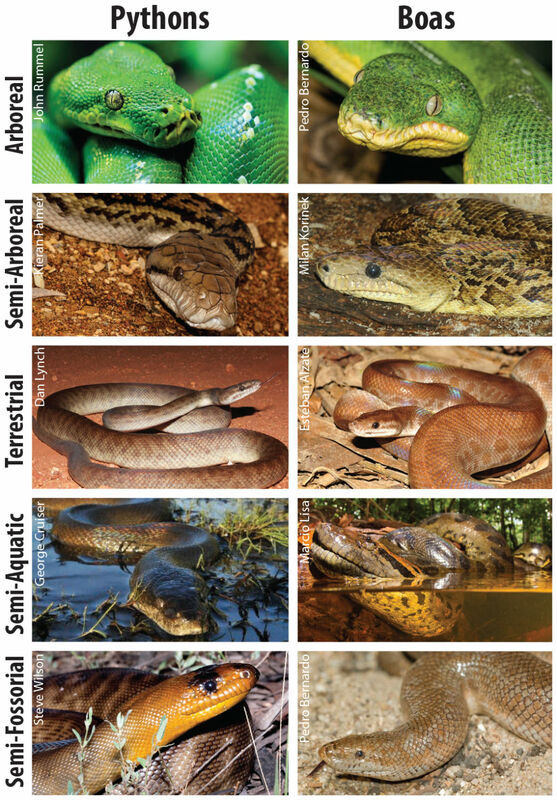 Boas have adapted to many ecosystems on all continents other than Australia and Antarctica, while pythons are widespread through Africa, Asia, and Australia. Their diversity has ranged from modest burrowers to the enormous Anacondas and Reticulated Pythons more than 8 meters (26 feet) long. As an example of their commonalities Esquerre said: “Aquatic boas like anacondas, and Australian water pythons, have evolved the same head shape, with eyes and nostrils on the back not the sides, which is ideal for moving through water and observing their environment from below.” On the other hand, he said, the tree dwellers of each family “have eyes on the sides and very wide heads, ideal for grabbing prey from hanging branches.” Rather than simply noting the commonalities, Esquerre used specialized techniques to measure and quantify skull shape, to demonstrate mathematically how tight the convergence has been. Pythons and boas also display convergent evolution in other aspects. The incentive for camouflage, for example, has led to similar coloring across the inhabitants of the same sorts of habitats, to the extent that green tree pythons and their emerald tree boa equivalents look almost indistinct to the untrained eye.